Blandy Faye Cabello, called Laling, was taken to the hospital with bleeding from the mouth and nose on September 16th. At the time, the doctor told her parents not to expect her to live. It has been confirmed Dengue Fever but the parents don’t have the money to transport her to the Dipolog hospital where she needs to go and we do not have enough funds in our medical expenses to help. Our website is getting finished but if you go to hopehomeandschool.com you can see more pictures of the children. Lilang, the little girl that has been in the hospital for over a week with Dengue Fever, is recovered enough that the doctor will allow her to go home. Once home, she has to continue with medication. This is a miracle in itself as she was not expected to live. The total expenses are a little over $250.00 USD. In America, this doesn’t sound bad at all. However, her father is a general laborer, and when he does have work, makes around $2.00 a day, so this is devastating to the family. We are helping as much as we can, but funds are low due to several other health needs recently. If you would consider helping with this urgent need, you may go to our donation link on our website athttp://hopehomeandschool.com/index.php/support/ You may also find our more information about what is happening there. The children at the children’s home told Inday, the lady that takes care of it and cooks the meals, to use the money for their meal to help Lilang and they would do without their meals. They wanted to help in the way that they can. Often this one meal a day is the majority of what they will have to eat, so it is really a sacrifice for them. Thank you for considering helping with this need and for your prayers for her. She is the one riding on my shoulders while the children were showing me around the village. Sunday morning at Sunday school class at Logansport Nazarene Church $70.00 was donated towards the remaining $150.00 for Lilang’s hospital bill. Sunday evening, an additional $10.00 was donated to be used as needed at Thornhope Community Holiness Church. Thank you to all that have helped so far with this need. 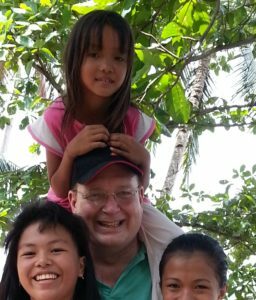 Lilang is now home from the hospital on 9/26/2016, because a substantial portion of the bill has been paid. They have signed a promissory note to pay the rest of the bill soon, (I don’t know the date when it has to be paid). She will have to continue medication at home for a while. This might be duplicates to some of you, but this is because I am putting it all in one place.